Lady Marauders’ junior Breanna Zirkle throws to first base, during Meigs’ 10-0 win on Thursday in Rocksprings, Ohio. ROCKSPRINGS, Ohio — Defensive dominance. 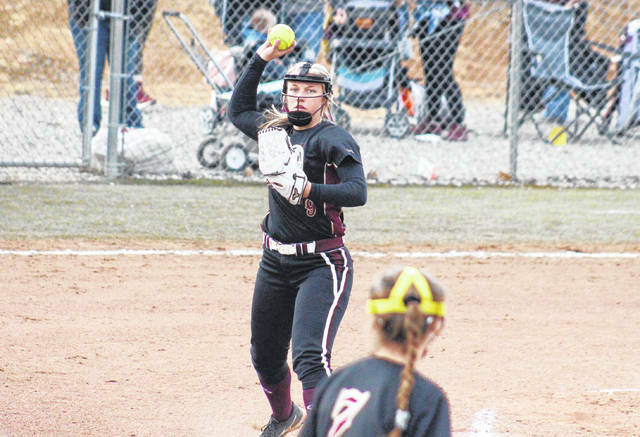 The Meigs softball team held non-conference guest Belpre to just one hit on Thursday in Meigs County, as the Lady Marauders rolled to a 10-0 mercy rule victory in six innings. 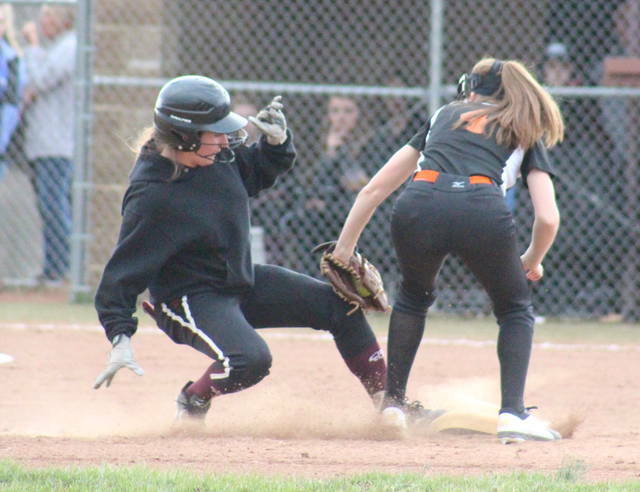 Meigs (3-0) — with its second shut out win of the year — scored once in each of the first two innings, and then exploded for seven runs before the first out was recorded in the bottom of the third. 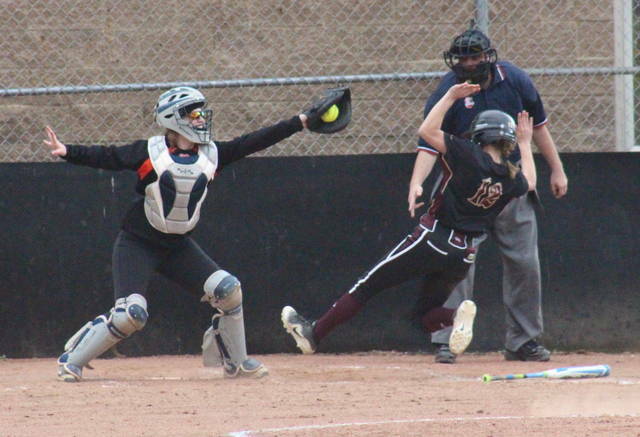 Belpre reached scoring position for the first and only time with a double to start the fourth, but the Lady Golden Eagles were retired in order over the remainder of game. After back-to-back scoreless frames, Meigs capped off the 10-0 mercy rule win with a run on a passed ball in the bottom of the sixth. MHS junior Breanna Zirkle was the winning pitcher of record in a complete game for the hosts, allowing one hit and striking out 11 batters. Hutchinson took the loss in two innings for the guests, allowing eight runs, six earned, on nine hits. McDaniel finished the game for BHS, striking out six batters, walking two, and allowing two runs, one earned, on two hits. Zirkle helped her own cause, going 3-for-3 with a double to lead the MHS offense. 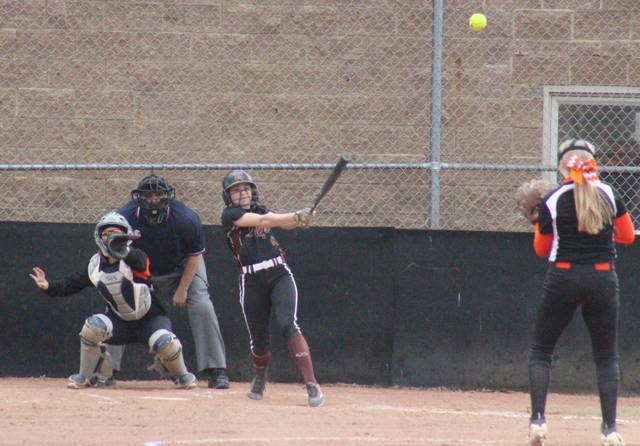 Ciera Older was 2-for-2 with two runs scored and two runs batted in for the hosts, while Taylor Swartz and Breanna Lilly both tripled once and scored twice. Alyssa Smith doubled once and drove in a run for the victors, Jerrica Smith earned a single, a run and two RBIs, Bailey Swatzel came up with a single, a run and an RBI, while Katie Hawkins singled once and drove in one run. Jadyn Floyd and Baylee Tracy each crossed home plate once in the win. Richards doubled to lead the BHS offense. The Lady Marauders committed one error and left three runners on base, while Belpre had three errors and two runners stranded. After a pair of non-conference twinbills to end the week, Meigs will begin Tri-Valley Conference Ohio Division play at River Valley on Monday.